With a breath-taking location above Kalamar bay, its own infinity-edged swimming pool and cool contemporary interiors. 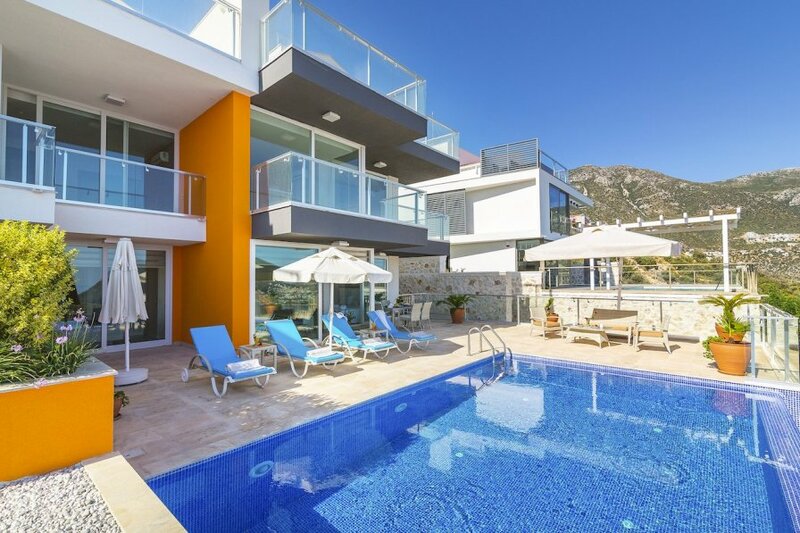 With a breath-taking location above Kalamar bay, its own infinity-edged swimming pool and cool contemporary interiors, two-bedroomed Villa Sultani packs in the benefits to bring you a relaxing holiday stay. The luxury villa is in Kalkan on Turkey's glittering Turquoise coast and is only a 20-minute walk to the town's centre with classic whitewashed house draped in vibrant bougainvillaea and a myriad of narrow streets lined with chic boutiques and friendly local restaurants. The spacious ground floor includes an open-plan living and kitchen area and is equipped with plenty of comfortable seating like a breakfast bar with stools and a cream corner sofa, adorned with playfully patterned cushions. The kitchen is also fully equipped with appliances including a microwave, dishwasher and coffee machine. The rooms are decorated in a modern colour palette of creams and beiges with large glass windows and doors letting the beautiful outdoors inside. Step straight from the living room onto the outdoor sun terrace, where the sparkling sea-facing pool really steals the limelight – kick off your flip-flops and dive in! If you're holidaying for warmer climates, there are plenty of cushioned sun loungers – perfect for finding your prime sunbathing spot. There's also a free-standing barbeque and an alfresco dining area for those romantic evenings in, alongside parasols for some shade. Fresh produce can be easily picked up in Kalkan town. Soak up the majestic coastal views here or from the bedrooms. There are two equally stylish options to choose from – a master with a double bed, en-suite shower room or a twin with two extra-long single beds. Both have direct access to the pool terrace. Thoughtful extra touches include plug socks by the beds so you can charge your phone and camera for a day full of sight-seeing, handy reading lights and plenty of wardrobe space for neatly stowing away your holiday belongings. -Master bedroom with an en-suite shower room and direct access to the pool terrace, where you can take a dip in the pool or soak up incredible views this property has to offer. -Twin bedroom twith direct access to the pool terrace. Villa Sultani overlooks Kalamar bay on Turkey's turquoise coast. Perfect for relaxing or exploring, it's in a quiet spot and is only a 20-minute walk from the centre of Kalkan town. There you'll find a beautiful boat-lined harbour, sandy beaches and colourful markets selling everything from hand-crafted traditional Turkish rugs (kilims) to fresh produce, jewellery and leather goods. Kalkan sits on a curving bay and has plenty of waterfront cafes and restaurants serving both traditional and international cuisine. Spend afternoons exploring the narrow streets and then stop for a cold coffee or tasty lunch that go hand-in-hand with magnificent views of the coastline. To experience Kalkan from another perspective, aquatic adventures beckon – jump on a traditional wooden gullet from the harbour and take a trip around the bays, stopping off for swimming. Kalkan is also renowned for its several beach clubs built into the rocks and there are more options for swimming and snorkelling. Kaputas Beach with crystal-clear waters and Patara Beach, a long stretch of shoreline that's also a National Park are both excellent choices. With day beach clubs at both, you can relax on the sand, take part in water sports like kayaking and parasailing or eat at the restaurants. By boat or kayak, you could visit the Kekova island where you can explore the part-sunken ruins of Dolchiste, an ancient town which was destroyed by an earthquake during the 2nd century. Boats usually leave from Kas, a lively town which is a 30-minute drive from Kalkan. Kas also has the impressive ancient site of Antiphellos, with still-visible ruins including a theatre. For more fun day trips, you could head to the seaside resort town of Fethiye, a one-hour drive away. It has plenty of top-notch restaurants, shops and fascinating cultural sites too that are well worth a visit.